In 1986, Vietnam opened its borders to the world and since then, the development of its economy has been growing really fastly, the tourism market also increased by 63%. This is why Khoa Luan decided to create ANH VIET MEDIA TV TOURIST CO.LTD the 29th of September 2004, and its tourism department the 25th of June 2010. The Vietnamese Ministry of Culture and Tourism provided to Anh Viet Tourist the International Travel License. 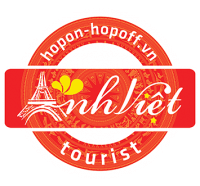 Today, the name of the company is ANH VIET MEDIA & TV TOURIST. ANHVIET TOURIST was chosen as strategy with Galileo. We had networking to IATA, ABACUS…. It is also important to know that the activity has slowed down in 2012 compared with the 2010 and 2011 years. Moreover, in the beginning of 2012, ANH VIET TOURIST invested in the creation of a new office in Nha Trang but the activity wasn’t profitable so the CEO decided to close the office. For the moment, the office in Ho Chi Minh is not really profitable, with a loss of 353,788,673 dongs in 2012 (around 15602 dollars) with represents a decrease of 290% compared to 2011 (91,501,658 dongs). That is the reason why it is really important to develop the activity before considerate a diversification of locals.